It’s been a beautiful autumn. The forest’s on fire, rich and glowing against the bruised purple of the hills. The rowan berries are bursting on the trees, pillar-box red, signalling, so people say, a harsh winter ahead. Worn out by its steady summer march, the bracken’s crumpled, rusted and turned in for the year. It slumps everywhere. This comes as a relief. From July onwards, nature can be overwhelming here on the west. Fuelled by the warmth and the wet, the undergrowth takes over – twisting, swelling and spreading. As it dies back, you can move freely through the woods and hills again. The countryside is laid bare and the signs of the past reveal themselves. One of the ruined cottages at Glenan. I wonder who lived here? Last week I wandered up to the deserted village on the hillside behind Glenan. During the summer it’s engulfed by green, but now the stone walls stand clear. It’s a haunting place, an old settlement set deep in the woods. The remains of the cottages – the last one abandoned about a hundred years ago – are dotted among the trees. When my mum was little, they still had their roofs. They’re long gone now, but the walls still stand. I perched on a rock and thought about the people who’d made their lives up here. Whose hands had built these cottages stone by carefully placed stone in this harsh place? What must they have felt at this time of the year with the cold and the dark and the scarcity of winter just around the corner? Like the bracken, perhaps they just gave into the cycle of nature, hunkered down and hid away until the soil warmed once again. One cottage drew me in. 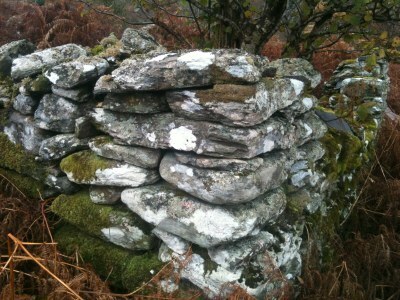 Its thick walls, the stones patched with paint-splats of lichen, had held strong over the years. A rowan stood in one corner, bare branches hanging with puffs of moss that were as silvery as the wintry sky. As I stood there, the sun went behind a cloud and the landscape darkened by a notch. The bracken rustled in an easy breeze. ‘Hush,’ it seemed to say. ‘It’s winter.’ And I pictured myself lighting a fire, curling up in this cottage in the woods and sleeping until spring. Thank you for your wonderful posts. I love reading them and allowing my heart to reconnect with all that Portavadie and its surroundings means to me. Thanks Karen. It’s a special place isn’t it? What’s your connection to Portavadie? You have a wonderful style of writing. Looking forward to reading more. Have you emerged from your seasonal snooze yet? Because I am missing your beautiful writing.